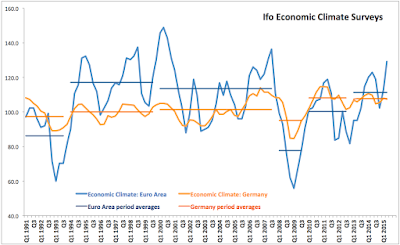 Ifo business climate index for Germany fell from 108.5 in May to 107.4 (expected 108.1) in June, while the business expectations index was down from 103 to 102 (also missing expectation for 102.5) and the current assessment index fell from 114.3 in May to 113.1 in June (missing expectations for a decline to 114.1). For all the media chatter about missed expectations, Ifo index is trending at levels consistent with close to 3% growth and well within the range of the average for Q1 2013-Q2 2015 period. As chart above shows, Ifo has been signalling strong growth momentum in Germany for some time now, with volatility of the index reading around period averages being less pronounced than for the euro area as a whole. The chart also shows recent uptick in economic climate conditions in the euro area as a whole. When we look at period averages, one interesting sub-trend to watch is the step-up change in growth conditions in the euro area as opposed to highly steady growth conditions in Germany.